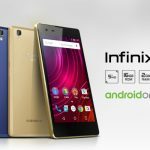 Infinix Hot 5 is another affordable smartphone from the Hong-Kong phone maker – Infinix Mobility. The phone came with an alternative known as Infinix Hot 5 Lite. Both the Hot 5 devices have very similar specs with just two differences; RAM capacity and the feature of a fingerprint scanner. The new Infinix Hot 5and Hot 5 lite offers a good mobile entertainment experience with its key feature 5.5HD screen, dual front speakers at the top and bottom of the smartphone with 3D Dirac stereo surrounding to boost sound. Both the Hot 5 devices, Infinix Hot 5 and Hot 5 Lite comes with a 5.5 inches screen with HD resolution of 720 by 1280 pixels. The display has been specially designed to serve well for multimedia and gaming purposes, hence the tagline “My Mobile Cinema”. Infinix Hot 5 shares a lot with its predecessor, along with an almost similar design. However, the Hot 5 brings with it some incredible features for all the media-junkies. The included dual front-facing speakers powered by Dirac Stereo Widening technology are enough reason to grab this device. Infinix Hot 5 has a back-mounted fingerprint scanner for advanced security purposes, this feature has eluded the Hot 5 Lite which is quite unfortunate. About the battery and power, they both have a 4000 mAh battery. That is enough battery to keep the light on for a longer period of time. The new Hot 5 devices have front and back LED flashlights for quality imaging, 8 megapixels camera is located at the back while the front sees a 5 megapixels camera. Infinix Hot 5 comes with Android 7.0 Nougat which is customized with the Infinix XOS. The XOS UI proves to be more interactive and provides a user-friendly experience with innovative features such as custom themes, Multi-Account, and Freezer while also reducing the impact on battery life.